A patch to realign the physical keyboard of the Tungsten C with the one managed by Palm OS. You may also choose to have Palm OS work with any of the QWERTY, QWERTZ or AZERTY keyboard independantly from the real keyboard. A patch to attempt to repair your Wi-Fi setup by resetting the Wi-Fi settings when the Wi-Fi parametrization became corrupted. The Tungsten C is a great device, widely used even though Palm stopped manufacturing it. As a consequence, more and more refurbished or secondhand Tungsten C devices are found on the market. The refurbished devices can sometimes come with a QWERTY, QWERTZ or AZERTY keyboard and offer another type of keyboard in the Keyboard Preferences Panel! And this can occur even with devices provided by Palm itself. This is what happened to me when they exchanged my broken device with a new one! ... and this is the reason why I developed this patch. TCtools was developed first to fix this issue, it is a patch to realign the physical keyboard of the Tungsten C with the one managed by Palm OS. 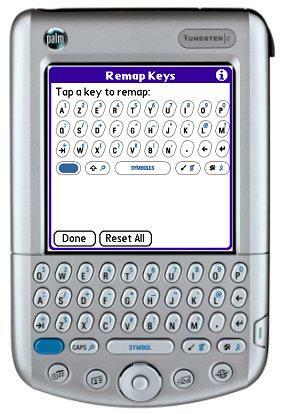 This will avoid you to have to remap manually all keys one by one, knowing that some of them cannot be remapped anyway (the backspace key cannot be remapped even though it is not at the same place on the QWERTY and the AZERTY keyboards for instance!). TCtools has another great effect: you may buy or use any Tungsten C device, not taking care of its keyboard. Applying TCtools will have you select your preferred keyboard layout. In the full version of TCtools, I provide images of all three QWERTY, QWERTZ and AZERTY keyboards. You may then print them, have the fun of cutting up the keys apart with precise scissors (because the keys are very small!) and finally stick them on the real keyboard for easier remembering of what keys really do. From time to time, especially if you connect to many different Wi-Fi hotspots, the Tungsten C may become unable to connect to any of the access points as configured in the Wi-Fi Preferences panel. TCtools offers an option to attempt to repair your Wi-Fi setup by resetting the Wi-Fi settings. Even though you will loose any previously configured networks and WEP settings when using it, you will find yourself with a brand new empty Wi-Fi setup and you should be able to start using Wi-Fi again on your device (but, of course, if the reason for the failure is a hardware one, TCtools will not be of any help!). The limitation of the trial version is that it simulates the keyboard patching and the Wi-Fi drivers patching without executing them. How to buy the full version of TCtools?